Note: we have opened the portal, currently, for the parents of seventh through twelfth-graders. In the future, the portal will be visible for grammar school students. 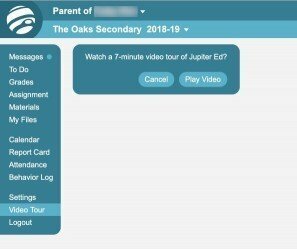 Jupiter is the name for the student information system that The Oaks uses to help us manage attendance, assignments, grades, discipline and more. Portal describes the area opened for parents to view the current progress of one or more of their enrolled children. A letter has been sent home with your student, containing helpful information on signing-in to Jupiter. We have also sent an email to each student's primary care-givers, providing your email address is on-file with the office. A typical Jupiter sign-in screen follows below. 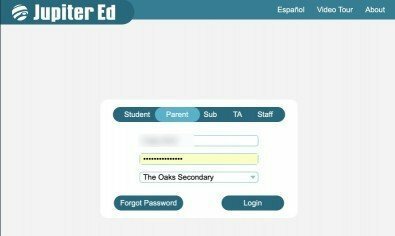 Enter your student's full name or, if you know it, their student ID, as well as your own password. If you cannot remember your password, click "Forgot Password" and follow Jupiter's instructions. To protect your security, we cannot access or change your password for you. After logging-in, you will be brought to the portal of the child whose name or ID was entered at the sign-in screen. 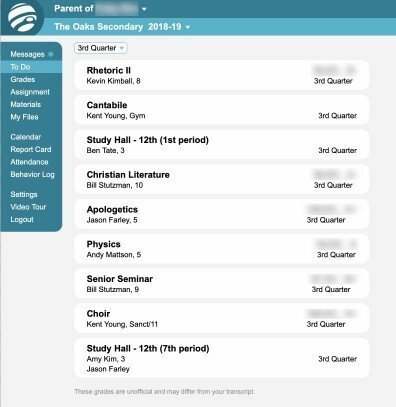 You can pull-down ("Parent of .. at the top") and browse other time periods for your student and/or the portal for your other enrolled secondary children. The tabs on the left describe the categories of information contained by the portal. We recommend viewing the video produced by Jupiter Ed. Please note that not all of the features supported by Jupiter are in use by The Oaks at this time. The To Do area shows the classes in which your student is enrolled, as well as their current grade. It will also display any assignment that is due within the next 24 hours.. In this and the illustrations which follow, we have grayed-out personal details about this typical student. 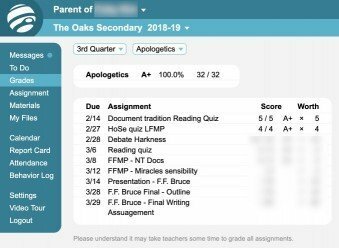 The Grades tab displays a student's graded assignments by class, by quarter. 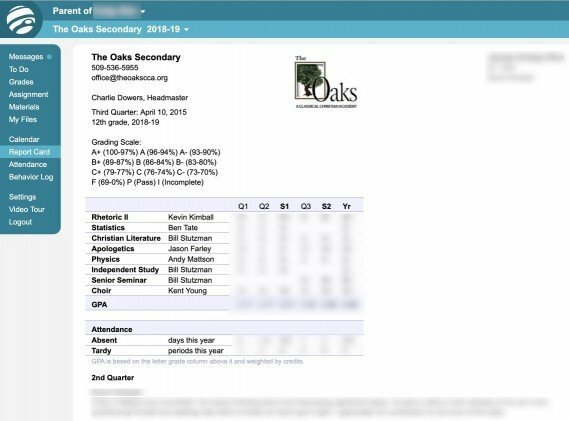 The Report Card tab displays the student's complete grades to-date, by quarter, for the current school year. The Attendance tab displays the student's attendance, by day, by class, across the current school year. The Behavior Log tab displays a student's attention grabbers by class, by quarter. A short description of the missing assignment or graded quiz/test is shown. 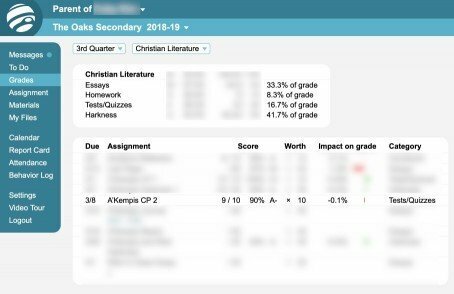 To learn more about the attention grabber, select the Grades tab and, if not already displayed, pull-down the class where the attention grabber was given to view the specific assignment. The student received an attention grabber for a missing assignment on March 8. We can see above that the assignment was turned in, late, and graded with a 10% deduction. The Settings tab enables each parent to customize how they wish to be notified about specific details of their student's progress. Web Msg is always set to 'on' by Jupiter. These refer to notifications visible to parents in a student's portal. Checking the Email box asks Jupiter to send a system-generated email to your current email address. We recommend leaving the Email default settings as-is. 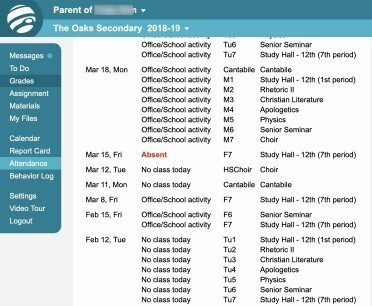 If, for instance, you uncheck 'messages', you will no longer receive important Oaks emails from teachers or the Office. You may check Text Msg boxes if you wish to receive certain notifications to your mobile device in addition to, or instead of, email. 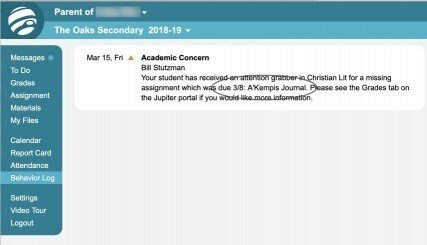 Finally, you may experiment with asking Jupiter to send you automated assignment or grade notifications that meet certain conditions by checking the boxes at the bottom of this portal form.